Crdi B and Heidi Klum hit the red carpet yesterday evening(January 28th) wearing different ASHI STUDIO dresses at the 60th Annual Grammy Awards at Madison Square Garden in New York. Cardi B who also attended a pre-Grammy party & performed at the show, wore a FALL 2017 COUTURE white off-the-shoulder feather embroidered hi-lo hem dress with a two-tier skirt that flowed into a train in the back. I like this dress but it is more suited for someone on the taller side. However strappy or ankle strap high heel sandals over her LOUBOUTIN pumps would have elongated her legs and made this work for her. MESSIKA jewelry finished up her look. Heidi Klum wore a sheer long sleeve black lace & dotted FALL 2017 tulle dress with a high neckline. While I don't think she looks bad, I just see this working more on someone like Hailee Steinfeld. LORRAINE SCHWARTZ jewelry, GIUSEPPE ZANOTTI sandals finished up her look. 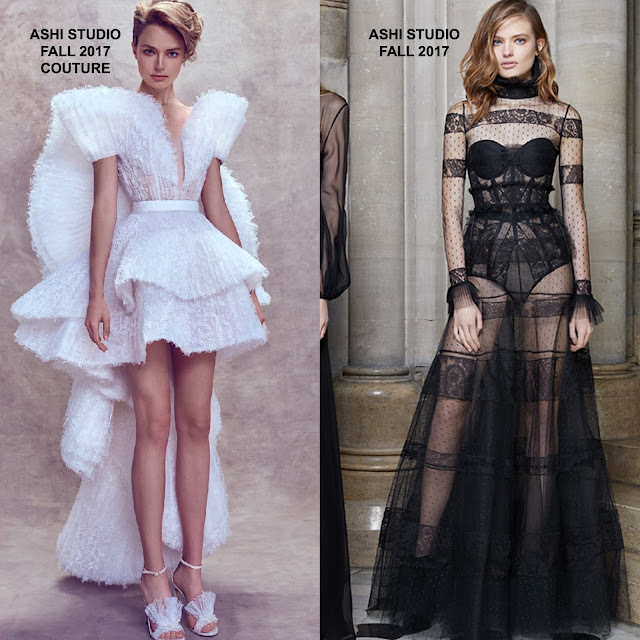 Who's Ashi Studio look do you prefer?